I am a big Star Wars fan and was attracted to the outfit Captain Cassian was wearing. I wondered if somehow I could get the matching jacket. My friend told me about FanJackets, and after going through this well-designed site, I ordered the jacket. To my surprise, the delivery came right on time, i.e within a week, and today I am proud to say that I love this jacket very much and I wear it frequently. It’s an excellent piece of apparel. It meets the descriptions as advertised. I have bought earlier from fanjackets, but this jacket has turned out to be the best of all. Its padding and color is so attractive that in my view, these are the two prominent features that have made this attire worth buying. Astonishing appearance and very nice fitting.. My brother first bought this jacket for himself. I was so inspired from it that I decided to buy one for myself too. 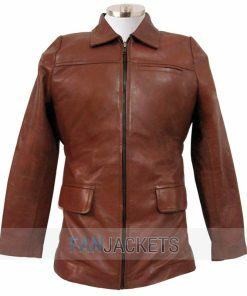 If you want a heroic, stylish, and casual wear altogether, the Captain Cassian Jacket alone has the three features. No matter where you are going or doing, it can best personify your casual activities. 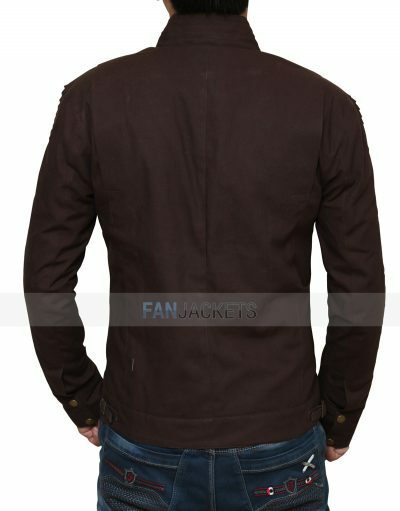 You can wear this brown cotton jacket at a party, or a date, or campus, or concert, or any other casual event. Its lovely color and perfect fitting will bring the best out of you. You are just one click away from this piece of perfection. Order now!